This article is about the normal showdown version. For the Xeno Clash version, see Xeno Diablo Clash. Diablo Showdown is one of the Normal Showdowns. It awards items to trade for the Diablo summon. Diablo Showdown can be farmed on Hard or Very Hard rather easily for newer players, allowing them to easily accumulate event items. For newer Dark players, unless you happened to draw a good Dark ATK summon, getting a copy of Diablo to use as your main summon is acceptable until you get something better. 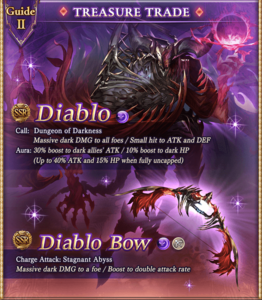 For all players, Diablo has a available and has favorable stats and a good call, so it is worth getting him anyway, though it might be smarter to just collect the uncap materials and hope to get 4 copies from drops rather than buying from the shop. None of the event weapons are worth spending resources on, so you can use them if you happen to get them, but don't use items to buy them or spend fodder skilling them up. Diablo Bow may be worth keeping for much later as some advanced Dark builds do use it, but do not spend resources buying it. 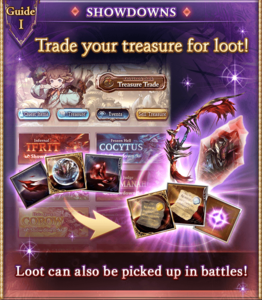 As with all showdowns, you can buy 5 Half Elixirs per month, one per day, and you should be able to get enough materials to buy all 5 each month while using less than 250 AP, so it's worth spending the time to farm this showdown. Only Diablo must be defeated to complete the battle. Damaging The Jaus Codex affects Diablo's mode bar. Casts Nightmare's Descent. Causes the Jaus Codex to cast Grim Ode. Duration: need to be checkedVerification needed. on one ally. The event shop sells the Diablo summon and Dark weapons. Items restock with higher costs when sold out. This page was last modified on 11 March 2019, at 18:08.